Glass Painting Course Lesson 2. Basic Flood Fill Painting. 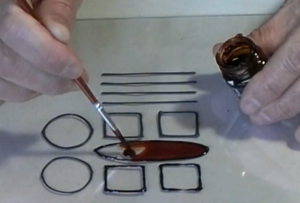 In this second part of the glass painting course we look at basic flood fill painting. 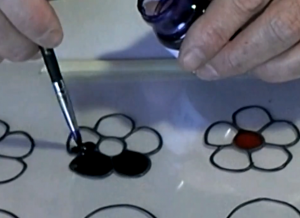 This is the basic method used in glass painting. It needs to be done flat and is suitable for virtually any non-porous surface. This includes glass, plastic, perspex, acetate, tile, mirror and more. It gives a lovely smooth finish (obviously emulating glass.) and can be done using either singe colours or a blend of complimentary colours. 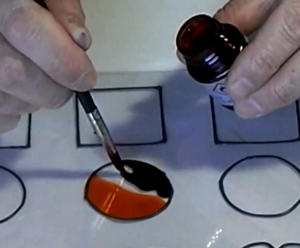 In order to use the flood fill technique you will need a flowing glass paint. It really doesn’t matter if this is waterbased or solvent, as long as it flows! Think of your outline as a reservoir which you are going to fill with paint. You don’t want to over do it so the paint flows over the top. But you want to put in enough paint so it is completely covered. You need to rethink the use of the paint brush a little. It is used to lift and drop the paint onto your work and then to push the paint around so it goes right up to the outline. However, at no point are you brushing on the surface! The solid type brushes are perfect to use for this. There is nothing wrong will a “normal” paint brush, I used one myself for glass painting for 10+ years. (and will still use one now for curved work). The great benefit of a solid brush is you can clean them with one wipe. This is really useful when you are using multiple colours. Don’t be stingy with the paint. The most common issue with beginners is that they don’t use enough. Most of us have experience of using paint and paint brushes in a certain way. One which is geared to putting a very thin coating of paint on a surface. With this you need to think more like you are filling a mould. In fact, if you’ve ever done it, the closest craft I can think of is cake decorating. When you are adding the paint it is the equivalent of “running out”. I doubt it’s a coincidence that one of the best glass painters in the UK, Alan Gear, co-author of The Complete Guide to glass painting, trained as a patisery chef. This is probably a part of glass painting which it is much easier to show in the video above than it is to write about. Once again the key is practice. As long as your outline is OK the painting should follow quite easily once you have realised how much paint you have to use. In a later lesson we will be looking more closely at using blends, special paints and special techniques. Another lesson will look at painting on none flat surfaces. TWO THUMBS UP. THANKS ! !